Our Grand Hybrid GP-500 was rigorously tested by Karen Marshall for Music Teacher Magazine. From the action to the sound read Karen’s findings below. For many pianists ranging from beginner to advanced, it is not always possible to practice on a traditional acoustic upright or grand piano. There may be space restrictions, neighbours and other family members to consider, or of course, budget limitations. Serious piano students can worry that practising on digital pianos (sometimes called electric pianos) will have a limiting effect on the development of their technique, or even damage it if they are already playing at a high level. Let's explore the pros and cons of this concern. Piano technique is a pianist's ability to carry out the technical requirements of a composition, and control the instrument they are playing to achieve a desired expressive outcome. There are probably two main areas that affect how a pianist can use or develop their technique... 1) the action of the piano - meaning the keyboard and hammer mechanism combined with how it feels under the fingers, and 2) the sound produced by a piano when reacting to the action. Depending on the abilities of a pianist, ranging from beginner to professional, these two areas will be of varying importance. WHAT MIGHT LIMIT YOUR PIANO TECHNIQUE? It really depends on the piano you are playing as to how you can either use the technique you already have, or develop a technique from scratch. It also depends on the genre of music you are playing, and at what level. Most people when starting out on their musical journey will begin on a relatively inexpensive instrument, and upgrade as their technique and musicianship grows. Leaving what are termed as 'keyboards' out of this discussion (usually with unweighted sprung keys), there are basically two different categories of piano, both having sub-categories within them. Stage pianos, digital pianos and digital hybrid pianos. Upright pianos and grand pianos. It is often assumed that all acoustic upright and grand pianos are going to be superior to anything in the digital category as far as developing a good technique is concerned. However, in my experience, if developing your technique to a high level is your goal, ALL the categories and sub-categories above will vary in action and sound to a greater or lesser extent. As well as this, you will find that the action and sound will differ between instruments within just one of these categories too. Not so long ago, there was quite a difference between the digital and acoustic categories in terms of both action and sound. Well maintained acoustic pianos usually always come out on top, but due to acoustics often requiring regular maintenance, they can quickly slip into disrepair, or develop an unpleasant sound. I've always pointed out that if a developing piano student had the option between an out of tune, poorly maintained acoustic, and a good quality consistently reliable digital, they would probably have a much better playing experience with the digital piano option. When I was studying music at college and university, each practise room had an upright acoustic piano in it, and each of them felt completely different as you moved from one to the other. The quality of the uprights would vary enormously, as would the state of repair. The practice rooms that had grand pianos in them tended to be more reliable and consistent, but the key action and the sound of each one was also very different. All these variations affect how you can either use your piano technique, or indeed, develop and refine it further. With this example in mind, it is clear that there can be a lack of consistency between the abilities of acoustic pianos. This could also be true of pianos in the digital category, but usually for reasons of the software and hardware rather than needing maintenance. Whilst developing my piano technique as a student, I had a digital piano at home to practise on, as well as an upright acoustic. The acoustic had limited capabilities due to the somewhat worn action, but I could do enough on it to get by in playing music from the advanced repertoire. I don't recall having any problems moving between one and the other, even though the digital piano had a somewhat lighter key weight than the acoustic. It's actually good practice for making quick on-the-spot adjustments to your playing when faced with using different pianos. This of course is a skill that pianists must acquire, whether they only ever play on two different pianos (their own and their teacher's), or, are playing at different venues. Quickly adapting to different pianos is an essential part of developing a good piano technique. Pianists off the top of my head who practise on a digital piano are Stephen Hough, Benjamin Grosvenor, Artur Pizarro and Josh Wright. Their technique is still very much intact! Let's be clear though... these pianists will also practise on acoustic grand pianos that they either own, or have access to at concert venues. I do advise that playing good quality acoustic pianos is an important thing to do for a developing pianist... even if it's somewhat occasionally. If you only ever play on one piano digital or acoustic, you will probably develop a technique within the confines of that specific instrument. You will become so familiar with it that you will know every nuance of it's action and sound, and will be able to predict how that piano behaves. This is great if you only ever intend to play this one piano, but you would be surprised at how strange it can feel to play an unfamiliar instrument. The sound and touch may be completely different to what you are use to, and as a teacher, I've seen many pupils sit down at one of my pianos and react with shock as they play the first few notes of their piece. As mentioned above, this is simply due to them practising all week on their own instrument, and expecting the feel and sound of another piano to be the same as they have grown accustomed to at home. If you are planning to perform, and wish to avoid the 'shock' of playing an unfamiliar instrument, practise on as many different instruments (digital and acoustic) as you can. This will allow you to adapt quickly and deliver a performance to the best of your ability. We have seen above that not all acoustic pianos can be described as preferable to digital pianos when it comes to developing and maintaining a piano technique. If the option is a badly maintained acoustic, you probably won't be able to develop any level of refinement in your playing, which will definitely hold you back in building your technique and enjoying your playing experience. On the other hand, if your situation allows, I would say that playing and excellent acoustic piano is probably the ultimate option. If you are limited by budget, and buying either a well maintained second hand acoustic or a brand new on is not an option, a good digital piano may be just what you need. What you will find however, is that your budget will dictate the amount of nuance that you can add to your playing due to the action of the keyboard and the quality of sound. This may either limit the development of your technique if you are moving toward an advanced level of playing, or not live up to what you can already do as an advanced player. In general, as you would expect, the more you spend, the more you move towards the realism of an acoustic, and the more your chosen instrument will respond to your technique. You don't have to break the bank though to purchase an instrument of quality and convincing authenticity. Unfortunately for me, an acoustic grand or upright piano is impractical. Being constrained by space, I needed a digital that emulated a well maintained acoustic piano. Something that would feel authentic, respond to my technique, and create a sound that behaves according to those things. There are then all the other benefits that a digital piano comes with, usually at a fraction of the price of a quality acoustic piano. One such instrument on the market at the moment is the Casio Celviano Grand Hybrid. As I write this post, the Grand Hybrid is the most affordable instrument in the 'hybrid' range of digital pianos currently available on the market. But, don't let an affordable price fool you into thinking that this is not a quality instrument. You don't half get a bang for your buck! WHAT IS A DIGITAL HYBRID PIANO? It was mentioned earlier that an important aspect of developing a good piano technique is the action of the keys. Although I would take the opportunity wherever you can to play well maintained acoustic pianos, the digital hybrid piano market has now really started to close the gap between acoustic and digital playing experience. Casio's collaboration with C. Bechstein on the Grand Hybrid's keyboard action means that the instrument benefits from world class experience when it comes to acoustic piano building. Hybrid pianos aim to combine the action of an acoustic piano with all the things that are usually expected from a digital piano. The advantage here is that you can feel more authenticity of touch under your fingers... as you would do of course on an acoustic piano. This leads to a higher quality of playing experience that enables you to use your technique (or develop it) along the same lines that you would do on a good acoustic. The Grand Hybrid makes an excellent practice instrument! As well as having a reliable and authentic action, this instrument is definitely designed with the serious pianist in mind. You can choose between three distinctive piano samples, which as far as your piano technique is concerned is a great way to practise adapting to different piano sounds. This really helps if you are planning to perform on unfamiliar pianos at some point. You could also adjust the touch sensitivity and practise adapting to a piano that requires either more or less finger strength in each key stroke. After exploring whether practising on a digital piano would damage your technique or not, I think the answer is a clear no. However, that would all depend on the quality of the instrument. Just like an acoustic piano can vary in quality, as well as its state of repair, you could make a similar argument against a digital piano and it's quality of action and sound. Playing on both acoustic and digital pianos can affect how we play to a lesser or greater extent, and being able to adapt to this depending on what is available to us is an important aspect of piano technique to develop. If you were thinking about investing in a digital piano due to being limited by living conditions that would rule out an acoustic, I'd recommend that you go for something like the Casio Celviano Grand Hybrid. You may even consider one as a second piano! You can be sure that it will allow you to develop or maintain your technique without the worry of having a vastly different experience when you play an acoustic piano. The Dulwich Music Festival runs several events throughout the year for piano at various London venues. The festival was established in 2012 by South London-based musician Lorraine Liyanage to address the need for local music events in the vibrant community of South London. The Festival is always an exciting time for Casio. This year however, the Festival was even more stimulating than usual: Casio teamed up with Dulwich Music Festival for the first digital piano competition for amateur pianists of all ages. This is the third year the festival has been sponsored by Casio but the first time we have offered a competitive music platform solely on digital pianos. We believe this is the first-ever digital piano competition held in the UK (and maybe further afield!). The competition was adjudicated by Claire Harris, Nikolas Sideris, Ben Norburyand Alison Mathews. Casio have gone one step further than recreating the sound of a grand piano and that is making the digital piano feel like a grand piano. They have incorporated C. Bechstein’s traditional wooden keys into the Grand Hybrid and it has also brought in a natural grand hammer action to enhance response and feedback, which in turn should enhance the expressiveness of playing. The Grand Hybrid feels satisfyingly weighty under the keys and I have not played another digital piano that actually feels like an acoustic piano. We had nearly 60 performers participating in a free piano competition on Sunday 11 June 2018 at Kingsdale Foundation School in South London. Many of my piano teacher colleagues are members of the new Casio Grand Hybrid Ambassador scheme info.casio.co.uk/pianoteachernetwork This allows us the opportunity to gain in-depth knowledge of the instruments and make recommendations to our students that are seeking a high-quality digital piano for use at home. One of my favourite features of the instrument which makes it ideal for learners is the Record and Playback function of the piano. I always encourage my students to record their performances and listen back to them to critique and review their technique and interpretation. The playback function lets you pause, fast-forward, rewind and A-B segment your performance during playback. This is a fantastic feature that lets you improve your playing skills by reviewing your own performance objectively afterwards. I also love the Concert Play function that improves students’ listening skills by playing along with live orchestra audio. Very few pianists will have the option to play with a live orchestra but with the Grand Hybrid piano, it is entirely possible to bring the orchestra to you and for you to become the soloist! Listen to the Concert Play sample tracks online. You can also choose which acoustic setting you want your performance to take place in – cathedral, opera house or concert hall. The choice is yours! For more information about the Casio CELVIANO Grand Hybrid pianos, please email me. You can play the pianos at Musicroom in Denmark Street, WC2, open 7 days a week.
" I love my Casio hybrid piano. It has enhanced both my piano teaching and personal music making opportunities. The touch is authentic and the sound quality is great. Many pianists who visit comment on the quality of sound. I enjoy having two pianos for teaching. With younger students the duet mode works well when playing in unison along side the student. This helps develop listening skills and rhythmic playing in a very intuitive way. For older students it is comfortable to teach from one piano whilst the student uses the other. We also play together during the learning stages of a piece which is a very instinctive way to refine skills such as rubato, tone and shaping. The various features like hall simulator, listener position, light to heavy touch options and different piano sounds are very useful, especially in the run up to a performance. I set the piano up differently each week and the student has to play on it and respond and alter touch in real time to create a balanced performance. A particularly fun and informative setting is harpsichord with no touch response (this sounds terribly unmusical, I know) but I use this when a student is underplaying the bass lines, particularly in Bach. There is a light bulb moment when they suddenly hear balance between their own hands. I use this piano along side my Steinway model O when playing two piano repertoire. It does a good job of holding its own against my grand. Sight reading concertos with the orchestral backing is a very rewarding way of improving this skill. There are also a range of other instrument voices to select which add colour and depth when we play in groups. The record function is ever useful and just last week I recorded a set of backing tracks for a singer who needed a specific key. The Casio hybrid is great value for money. It is easy to use and I wouldn’t be without it now. Highly acclaimed practice resources for students of all ages and stages. Instant download available as well as many freebies. Please check out my website for further details on what I offer in addition to piano lessons." So, you probably know that a Hybrid car combines petrol and electric motors for cleaner emissions. But, what's about a hybrid piano all about? Grand Hybrid pianos have moving hammers, to make the key feel more authentic when playing. The keys of an acoustic piano are connected to hammers which hit strings to make the sound. A hybrid piano also has hammers but produces sound electronically. This means there are no strings to tune, and the instrument can be made smaller to fit into living spaces more easily. 2. Hammers make the touch more authentic. Although there are no strings, it is important to keep the hammers. It's this moving mechanism attached to each key that pianists can feel when they play. If you remove this, as most digital pianos do, the movement of the keys is different (even though the keys themselves might look similar). 3. Hybrids have real piano keys. 4. Hybrids use the same key length as acoustic pianos. 82% of surveyed teachers said that the feel of the keys is the most important part of a piano. But, conventional digital pianos often don't measure up in this area: their plastic keys are shorter when compared to an acoustic piano. This compromises the key movement and the instrument feels less realistic. With a hybrid piano, the key length is the same as an acoustic piano, which means the travel and bounce of each key is much closer to that of a real Grand. Grand Hybrid pianos have three different Grand Piano tones stored inside them, such as a C. Bechstein D282 (right). 5. You can have three different Grand piano sounds in one instrument. Because the sound of a hybrid piano is produced digitally, without strings, you can make the instrument produce more than one traditional piano tone. 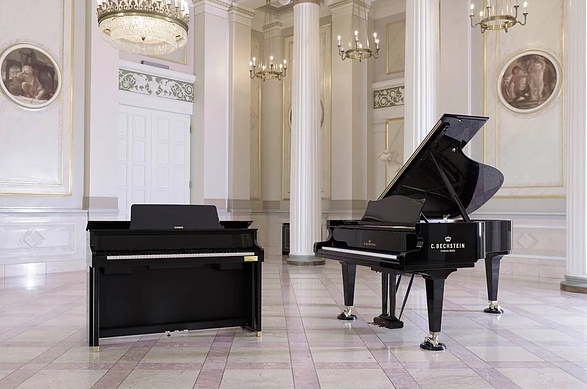 Casio's Grand Hybrid range includes the tone of three of Europe's most finest brands of acoustic piano, including a £115,000 C. Bechstein D282 piano. Irene Veneziano plays "Allegro de Concierto, OP. 46" by Enrique Granados on a CELVIANO Grand Hybrid GP-500BP in the beautiful gardens of Palazzo Gromo Losa in Biella (Italy). 6. You can play them in the garden. Ok, not permanently, but the serious point here is that a hybrid piano is more resilient than its acoustic counterpart. This means it will live happily in spaces that wouldn't be suitable for traditional pianos, such as in direct sunlight, a conservatory or summer house, or next to a radiator. 7. You can plug headphones in, for silent practice. Even though hybrid pianos use a lot of acoustic piano principles for their feel, the sound is purely digital, so can still plug in headphones and get the best of both worlds: the touch of an acoustic piano with the convenience of digital sound. The Frankfurt MusikMesse show is always an exciting time for Casio. This year however, the atmosphere was even more electrifying than usual: the incredible new CT-X keyboards were making their European debut, launched by none other than Grammy award-winning artist, Cory Henry. As expected, Cory produces a masterful set, wowing the thousands of visitors and putting the new CT-X keyboards through their paces. After the show, Casio's Jack Terroni caught up with Cory to chat to him about the new keyboards. "Cory, that was an amazing set. A lot of people here are saying how impressed they are with the quality of the new sounds. How authentic do you feel the CT-X range’s AiX Sound Source is?" It felt good when I was tracking for the Casio video, the sounds I used in that shoot was really fun! For a starter keyboard you really get great sonic sounds that make you feel as if you are at a professional level, that’s really important. "I noticed you took great care in adjusting the EQs and Effects on the Keyboard. How important is it to you to be able to refine your sound?" Yeah, I like my sounds with a lot of low end and on the dry side, with the ability to build effects in if necessary. I like to hear how the tone sounds before effects are added. My boy Rich (Richard Formidoni, Casio US Product Marketing Manager), when he bought the board over, he was like, ‘You gotta hear this man!’ It was cool to hear the CT-X in the raw, you’ve got a good 'board there! "When choosing a Keyboard what are the things you look for?" It’s kind of like a 5 point checklist: touch, sound, the ability to navigate smoothly through the keyboard, how many keys, the design… there’s a lot of the different things I look for. "What music among contemporary artists are you currently listening to and where do you see the state of music at presently? It’s in a good place, the music is in a good place - I’ve been digging recently Anderson Paak, Kendrick Lamar, Esperanza Spalding and Robert Glasper are amazing… they are really progressing the art form. "What do you value more in a keyboard player, technical proficiency or ‘feel’?" "Your epic keys solo in the track ‘Lingus’ from the Snarky Puppy, ‘We like it here’ LIVE DVD is often listened to here at Casio Music UK. What are your memories of that day and your time with Snarky Puppy?" That day was cool, although I wasn’t really feeling that well - we had recorded two shows a day for 4 days that week! I think they took the ‘Thursday’ (solo for the DVD). However, I think my best day was the second set on the Tuesday. I remember playing that solo and I looked at Mike and was like ‘THIS IS IT!’ and then when the record came out, we were out and I heard it and it was not the ‘Tuesday’ one! Mike said, ‘…well the band sounded better…(on the Thursday session)’. I got it, it was cool, no problem -because by the time I played the last solo on the Thursday I had already played it 7 times, so by the eighth time I just thought I’m gonna let this one hang! I picked some new sounds, I played totally different… I tried a piano track, a rhodes pad, lots of different tones and I’m glad I did it, because I was happy with the one that made the cut after the fact. Playing with Snarky was great, it was wonderful to be with those guys and travel the world. Everyone in that band was a genius in their own right, it was cool to be in a situation where no one wanted to overstep each other and just play together. It was wonderful. New Year, New Piano: Dr Chris Stanbury looks at Casio’s brand new AP-270 and AP-470 Celviano digital pianos. As we’re well into January, you might find your New Year’s resolutions might need a bit of help along the way by now. If buying a new digital piano was on the top of your list, I’d recommend you look at Casio’s new Celviano pianos. Casio has gone through a huge renaissance recently, and a massive investment in research and development has produced some incredible products that have really caught the eyes (and ears) of the music industry. With this in mind, I was really interested to see what innovations Casio had put into the new 2017 range of AP series digital pianos. The previous range of Celvianos were so successful, surely no designer would want to change the winning formula? At first glance though, it’s obvious that both instruments (the entry-level AP-270 and the larger AP-470) have been completely redesigned. Casio are definitely aiming high here: everything has a quality feel and even the ebony and ivory textures on the keys have been refined. Casio say that the control panel has been completely redesigned following customer feedback. The whole panel has now been moved to the far left of the keyboard, giving both models a sleeker, premium look. It’s also possible to control these new Celviano models with the Chordana Play Piano app* (for iOS and Android), where you can select different sounds, record your performances and even read musical scores in PDF format. Chordana Play Piano lets you control the piano functions from your phone, learn new pieces and view PDF music files (iOS & Android*). Less obvious, but just as important, are the big improvements that Casio have made to the sound. I had the chance to hear the old models of Celviano next to these new instruments while I was at Casio’s head office, and the difference is huge. 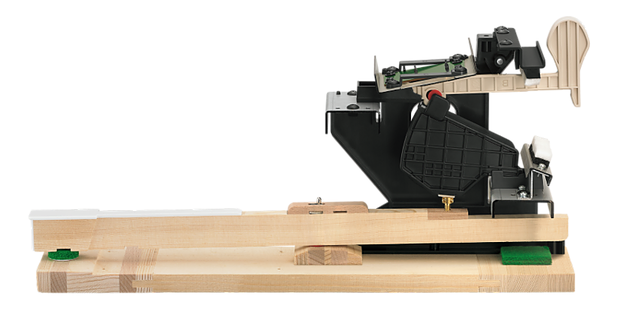 Both the AP-270 and AP-470 now have two new Concert Grand Piano tones. Why two piano sounds? Well, the answer is in the variety and interest that it gives you as a performer. Grand Piano 1, a majestic European grand, is perfect for classical pieces, whilst the resonant sound of Grand Piano 2 is perfect for jazz and pop songs. Having two pianos for the price of one is brilliant - you’ll always find a tone that suits your style. Whilst we’re talking about useful features for students, Casio’s Concert Play (available on both models) is definitely worth a mention. These are recordings of favourite classical pieces played by a real symphony orchestra which you can play along to thanks to the included piano score. As well as being great fun, Concert Play really inspires you to improve your music reading skills and hone your abilities in playing along with an ensemble. Usually, entry level digital pianos leave me rather uninspired, as most piano manufacturers use basic key mechanisms which don't feel as good to play as the more expensive models. With the Casio AP-270 however, this isn’t the case: the key action is the same as in larger instruments in the range. This makes the AP-270 fantastic value for money: you’re getting a premium key action that will support music learning for years to come, even up to the highest levels of performance. For me, this alone makes the AP-270 one of the best starter instruments available today and one that I would definitely recommend to students of all ages and abilities. What more does the AP-470 offer? Put simply, it’s an improved sound and some very useful extra features. When I moved on to the AP-470 after playing the AP-270, I immediately noticed that the piano tone seemed 'bigger'. Casio say this is for two reasons: the speaker system used is nearly three times more powerful than the AP-270, and this larger instrument also has extra string resonance (a computer recreation of all the extra harmonics that an acoustic piano produces) which gives it a warmer sound. The opening acoustic lid, which lifts up just like a grand piano, gives the instrument that extra finesse (not to mention a bigger spread of sound, too). Also, there are some really useful extra features on the AP-470, such as the ability to customise the piano tone to your own taste. The best feature for me though was USB Audio, which means you can record your performance straight to USB memory stick as digital audio, ready to share with friends and family. Overall, I was really impressed with both the AP-270 and AP-470. I was expecting some small improvements, but these two instruments represent a giant leap forward in terms of quality and value for money. So, you're thinking of buying a new piano or keyboard. Imagine it’s unwrapped, out of the box and switched on. You’re ready to go, but how do you know where to start? Wouldn’t it be great if your new instrument came with some music that actually made you want to play and, more importantly, inspire you to keep practising and learning? With selected models of Casio keyboards and pianos, that's exactly what happens. Their new collaboration with Rockschool, one of the UK’s leading music exam boards for Rock and Pop music, has produced a free downloadable digital sheet music book that starts you playing some of your favourite pop songs straight away. Forget having to begin your keyboard journey with dry technical exercises or tunes that you don't recognise: for the first time, you can begin by playing songs that everybody knows and loves, which means it's much more likely that you'll carry on playing. Not only are there some great arrangements of songs by Coldplay, Ray Charles and Alicia Keys, but the backing tracks to each song are included as well. This means that you can hear the drums, bass and other parts of the song as you play the keyboard. This is such an inspirational feature, as you’re no longer practising ‘on you own’ and instead have a whole band to accompany you each time you play . Every arrangement is produced by some of the UK’s top educators at Rockschool, which means the challenges and musical techniques used are cleverly designed to inspire but not frustrate beginning players. The music is easy to follow, the presentation looks great and every piece offers an exciting challenge which keeps you coming back for more. Having a structured, properly-designed series of pieces is so much better for learning than struggling with YouTube videos, which are often over complex and not always straightforward. What’s more, you can even use these songs in a Rockschool music exam if you wish. Whatever style of pop music you’re into, you’ll find something of interest in the downloadable pack, which is included with selected models of Casio keyboard and piano*. From Alicia Keys’ No. 1 Falllin’, Coldplay’s The Scientist or Ray Charles’ Hallelujah I Love Her So, there’s a variety of styles on offer together with some specially-commissioned original pieces written by the Rockschool team. If you’re thinking of buying a keyboard or piano for you or someone in the family, but have been put off because you worry they won’t stick to it, it’s definitely worth giving a Rockschool-powered Casio instrument a go. As any music teacher will tell you, music practice should be fun and inspirational, and this new downloadable pack does just that. *Free downloadable digital sheet music book available with the purchase of the following models: CTK-3500, CTK-6200, CTK-7200, WK-7600, PX-160.